New-style boards are all about excitement, action, air and adrenalin. Unique new mutations appear as fast as outside-the-box thinkers dream up crazy ways of riding a board behind the boat. We’ll sketch out several of the variants, beginning with the now-old-school wakeboard. 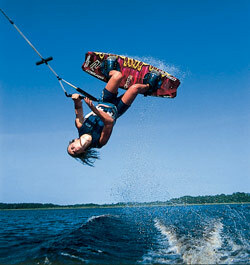 See below for selection advice on wakesurfs and wakeskates. See also our Advisor on Selecting a Kneeboard. 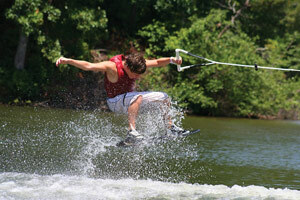 Wakeboards are like wide, short waterskis that attach to your feet with sideways bindings. They look a bit like small snowboards and share many similarities. They also borrow properties from surfboards, skateboards, and slalom skis. Thin, sharp rails (edges) make for tight turns across the wake, and the combination of light weight and lots of surface area permits big air and advanced tricks. Wakeboard bindings differ from the forward-facing waterski bindings and can be adjusted for angle as well as placement on the board. Riders decide which “stance” to ride in, right foot or left in back. Popular wisdom has it that your dominant foot should be your back foot. The “Push Test”—someone pushing you from behind and your involuntary step forward indicates your dominant foot—has been used by boardriders since time immemorial. (People who don’t step forward and instead smack their faces on the dock probably shouldn’t be wakeboarding). The sides of the wakeboard are called edges. You have a heel-side edge and a toe-side edge on your board. The heel-side edge is the side of the board closest to your heels. Most riders are more comfortable edging with this edge when beginning. The tip is the end of the board closest to the boat when riding. The tail is the end of the board farthest from the boat when riding. How big of a board do I need? Rule of thumb for wakeboard sizing: start with the idea that a 130lb. person uses a 130cm (50 11/16") board. Pretty easy, right? Then, add 2cm of board length for every 10lb. of rider weight. Besides rider weight, factor in rider ability when choosing a board. Larger boards give more stability and are better for beginners. More experienced riders prefer shorter boards that allow easier maneuverability and more advanced tricks. The wakeboard industry helps you to learn the metric system by mixing inches and centimeters. The rocker of a board is how curved it is, or how much higher the tips of the board are from the middle when it sits on a flat surface. The style and amount of rocker is a key variable in how a board performs. Rocker usually varies somewhere between 2" and 2.5". More rocker makes surface spins easier and softens landings from aerial tricks, but it also makes the board slower. Blended three-stage rocker: generates good speed into the wake without typical three-stage drag. Explosive vertical pop. Subtle three-stage rocker: stepping stone to the three-stage style of ride. Uses a smaller flat spot between your feet, with just enough vertical pop so you know it’s there. Abrupt continuous rocker: slightly exaggerated tip and tail rocker creates pop without sacrificing speed into the wake. Adds a little more kick. Continuous rocker: generates a longer trajectory with similar pop every time. Speed and fluid, predictable pop. High-density polyurethane foam is injected into a mold and heated to form the core. The core is then wrapped with fiberglass, carbon/graphite or a combination of these, and the surfaces are saturated with an epoxy resin. Layers of either carbon/graphite or thick, high-density fiberglass mat are added to provide stiffness to different areas of the board. Top and bottom layers are added, made of either PBT or Acrylan, and this is put into a mold in a heated press to bond the layers together and provide the board shape. Material options in this process determine the performance and price of a particular model. Carbon/ graphite is stronger, lighter and more expensive than fiberglass mat, and is found in high-end products. Some manufacturers use strips of ABS plastic or laminated wood embedded in the foam core for additional stiffness; others offer boards with an aluminum honeycomb core. Aluminum core boards are lighter weight and stiffer, but are also much more expensive to produce. PBT tops (also referred to as ABS by some manufacturers) produce brighter, more colorful graphics, and resist scratches and dents better than other materials. Besides the type of reinforcing fiber and core, the other variable in this building process is how the manufacturer chooses to install the threaded inserts used to mount the bindings. Some manufacturers drill holes at the proper positions and screw threaded inserts into the core. Others insert ABS plastic blocks into the foam core before lay-up, after which the blocks are drilled and the inserts installed as part of the finishing process. The third method is to install ABS plastic blocks into the foam cores that already have the threaded caps in place. During finishing, shallow holes are drilled to clear away the cover material from the threads. This third method (sometimes called snowboard-style inserts) is the strongest way of attaching bindings, although insert failure for any of the attachment methods is rare when bindings are properly tightened. Basic open-toed boots: great for beginners or multiple riders. Heel cup provides support and comfort; they’re fairly easy to get into; fully adjustable; one size fits all. Single lacing system or Velcro® lacing. Midrange-high end boots: high wrap ankle support; contoured footbeds; more control of board; better fit but harder to get into; bright colors and graphics. Dual zone lacing system adjusts the top and bottom independently. Hinge-style boots include a revolutionary rear-entry system so they’re easy to get into or out of. One of the hardest parts of wakeboarding is putting your boots on and taking them off. Hinge style boots offer unprecedented convenience, and they often have the best fit. Another major difference in board shape is bottom design. Most boards have either channels or ridges running lengthwise along the bottom. These provide tracking and help keep the board going straight. This is especially important to get the board pointing in the right direction during deepwater starts, and for faster recovery when landing aerial moves. Some models have more pronounced fins molded into each side of the tips to help hold the board in the water during hard turns. 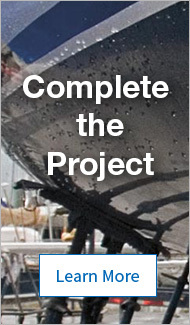 This is a holdover from and improvement over the multiple-fin boards common a few years ago. Wakeboard rails, or edges, determine how well the board performs in hard turns. Thinner rails, formed by beveling the edge or by pressing a thinner edge during construction, allow the board to sink deeper into the water during turns, giving the rider more control. When wakeboarding began, boards with large fins, multiple fins, or both were common. Design was focused on keeping the boards moving in a straight line for slalom course turns or wake-jump landings. As the sport and rider abilities progressed, surface moves like powerslides and spins became popular, and multiple fins became an obstacle. Wakeboard design over the past few years has been focused on finding alternative bottom shapes like channels or ridges to provide control without sacrificing spinning ability. Increased rocker gets the remaining fins out of the water during surface moves. This said, wakeboards still rely heavily on fins. When performing hard turns, the fin on the tail of the board is deep in the water and helps prevent the board from sliding out from under the rider. When landing a jump, the fins cut in first and straighten out the board to help the rider recover more quickly. Fins range from around 1.5" to 2.25". Larger fins are better for more aerial tricks where landing is important, while riders concentrating on surface moves should choose smaller fins. Those just learning to ride should choose larger fins for more stability and to help with deepwater starts. Wakeskates are cousins to the skateboard, and look like skateboards without wheels or trucks. Riders wear special water shoes and there are no bindings. Decks: flat decks are better for beginners, while more rocker produces better maneuverability and tricks. Plywood decks give a true skateboard-like feel. Compression molded composite skates feel more like a wakeboard. Sizing: select the length that best matches your weight. If your weight matches more than one size, you’ll get more maneuverability from a smaller skate, but stay on plane at lower speeds with a longer deck. Tops: foam tops offer a soft surface, compatible with bare feet. Grip tape top provides skateboard-like feel for a rider wearing shoes. Note: Wakeskates should only be used behind boats with inboard engines. Surf the wake of a slow-moving boat (compared to wakeboarding speeds) on a wakesurf. They’re larger than wakeboards and are often used with no towline, once you are up and riding the wake. Surfboard style wakesurf boards are the best for beginning/intermediate riders. Freestyle boards are smaller, look more like a wakeboard, and are best for tricks, but more difficult for riding behind a small-intermediate size wake. Note: Wakesurfs should only be used behind boats with inboard engines.